On Saturday, November 14, 2009, from 9:30 am-5 pm the “Woman with a Movie Camera: Alice Guy Blaché Symposium,” was held at the Iris & B. Gerald Cantor Film Center, New York University, 36 East 8th Street, New York. The event was co-sponsored by the Whitney’s Education Department and the Department of Cinema Studies, Tisch School of the Arts, New York University. 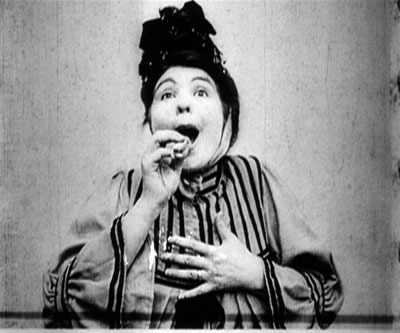 The purpose of the symposium was to explore filmmaker Alice Guy Blaché’s imaginative and pioneering approach to film and compare it to present-day cinematic innovations in the spirit of her work. Alice Guy Blaché (1873-1968) was a trailblazer, inventor, and innovator, cinema’s first female director and first female film studio owner. Her legacy extends to groundbreaking filmmaking techniques, novel approaches to narrative, and original directorial style. This symposium explored that legacy. Her talk focused on how Alice Guy’s career began at Gaumont and her principal achievements there. They key points of the talk are listed below. •Guy Blaché created the role of director, as she didn’t operate the camera herself. At Gaumontt she usually worked with, Anatole Thiberville. So she was the first to separate the role of directing from that director of photography/camera operator. • She made movies to be colored. As Gaumont invented or invested in various systems for coloring film, including painting film frames by hand, she would make movies to show off those techniques. The Whitney Retorspective has an excellent selection of films preserved with their original hand coloring, tinting or toning, or preserved to match their original look. •She used real locations, as the Lumières did most of the time. This was primarily to save money, but it gives her films a very modern look (compared to Méliès or Zecca) and became part of her signature style. •She was a pioneer in directing synchronized sound films. In 1902 Gaumont patented his Chronophone system, and by 1906 Alice had directed over 150 films for that system. The sound was recorded first and the image then filmed in sync with the sound afterwards. • Special effects. 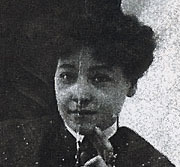 Alice Guy learned special effects from still photographer/Gaumont consultant Frederic Dillaye, and applied them to motion pictures, such as superimpositions, backlighting (contre jour), and many others. She also learned a few tricks from Ferdinand Zecca when he worked for her briefly in 1903. She applied what she knew in innovative ways to her dramatic films and when she made movies in the US she was quite surprised how little American filmmakers knew about how to achieve in-camera effects such as depth of field or superimposition. She was using techniques that Jean Renoir would get famous for many years later. •She was one of the first to use close-ups to dramatic effect. We see this especially in Madame a des Envies. D.W. Griffith was given credit for first dramatic use of the close up in 1908, but Alice Guy did it in 1906, and much more effectively than he did. • The most important: she was the first and for many years the only filmmaker who focused on the psychological/emotional journey of a lead character; everything in the film was designed to tell the story of a character's arc. Those like Zecca who copied her films often did not understand how she did this, and their copies are inferior as a result. The second talk was given by Richard Koszarski, associate professor of English and film studies at Rutgers University, and the editor-in-chief of Film History: An International Journal. You can see him talking about the book here. Prof. Koszarski focused on Guy Blaché's groundbreaking work as a studio owner. He described the process she and Herbert went through to buy the land they built the Solax studio on, and the phases of contruction for the studio, showing us several never-before-seen images. Lunch for the panelists was Sponsored by the French Embassy and took place at an excellent Thai restaurant, Cafetasia next door to the symposium venue (38 East 8th Street). Terry Lawler, the Executive Director of New York Women in Film & Television, as well Vice President/Board of Directors of the New York Production Alliance. She also serves on the advisory committee of Reel New York, an independent film and video series broadcast on WNET/13. She was production executive on several network television specials and Executive Producer of Visions of Light: The Art of Cinematography (1992), which won Best Documentary awards from the American Society of Film Critics and the New York Film Critics Circle in 1992, and Hollywood Mavericks, which premiered at the Sundance Film Festival in 1990. Ms. Lawler talked about NYWIFT's Women's Film Preservation Fund . The Women's Film Preservation Fund (WFPF) is the only program in the world that works to preserve the cultural legacy of women in the industry. 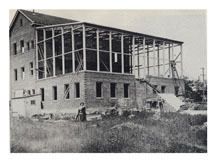 It was founded in 1995 by NYWIFT in conjunction with the Museum of Modern Art. The next speaker was Kim Tomadjoglou, Moving image preservationist, curator, historian. Tomadjoglou preserved the six films that were newly preserved for the show, and contributed an article to the Alice Guy, Film Pioneer catalogue, as well as updating the filmographies from McMahan's book, Lost Visionary of the Cinema. She recently guest-edited and contributed an introduction for an amazing issue on color in early cinema for Film History. Tomadjoglou wasn’t able to be there due to illness, so Joan Simon talked about how the Whitney show has emphasized how Alice Guy used color in her films, and how preserving these films with the color in them has led to a new appreciation of Alice Guy’s vision. The first speaker was Rick Altman, Professor of Cinema and Comparative Literature at the University of Iowa, where he has taught since 1974. Cinema/Sound (1980), Sound Theory/Sound Practice (1992), The Sounds of Early Cinema (with Richard Abel, 2001), and Silent Film Sound (2004), and on Hollywood genres, including Genre: The Musical (1981), The American Film Musical (1987), and Film/Genre (1999) and his latest book, A Theory of Narrative (Columbia UP, 2008). performances of his Living Nickelodeon program (which recreates the programming and audience participation atmosphere of an early film theater). Altman talked about why the post-synchronized sound systems like the Gaumont Chronophone didn't succeed. He said that one reason those systems didn't succeed is because they "re-mediated" (that's a term coined by JD Bolter and Richard Gruscin in their book Remediation. Bolter and Gruscin argue that visual media achieve their cultural significance precisely by paying homage to, rivaling, and refashioning such earlier media as perspective painting, photography, film and television. They call this process of refashioning "remediation" and they note that earlier media have also refashioned one another: photography remidiated painting, film remediated stage production and photography, and television remediated film, vaudeville and radio.). Altman argued that these post-synchronized sound systems pretended to be trumped up phonographs, and that's why they stuck to the vaudeville acts. So they didn't take full advantage for all the things sync sound could do (like tell a story better) and as a result didn't take off. The Vitaphone system used by the Jazz Singer was essentially 1909 technology, but the way the whole thing was conceptualized -- a feature film, etc -- is what made it work. The last speaker on the symposium was Virginia Heffernan, a journalist for the New York Times whose keeps a popular blog called About the Medium. About The Medium deals with issues of conversion between television and the internet. Heffernan asks, who’s going to watch all this here-goes-nothing online video? Everything from political propaganda videos to pseudo-candid celebrity rants seems to expect an audience. “The Medium” finds, reviews and makes sense of all those senseless new images: web video, viral video, user-driven video, custom interactive video, embedded video ads, web-based VOD, broadband television, diavlogs, vcasts, vlogs, video podcasts, mobisodes, webisodes, mashups and more. Heffernan'a talk focused on You-tube. She has identified some micro genres on Youtube (dancing pregnant women, salvia drug trips, haul movies -- in which where people talk about what they bought when they were shopping-- etc.). Her talk was hysterically funny and reminded us of how Alice Guy Blaché's films must have seemed to their original audiences.